Found 36 file extension associations related to BatchPhoto and 3 file formats developed specifically for use with BatchPhoto. BatchPhoto is a powerful photo manipulation program that makes it easy to touch-up, annotate, transform, apply effects, and rename hundreds of photos in a single operation. BatchPhoto lets you select a group of pictures, define a series of edits, and apply them in a single operation. 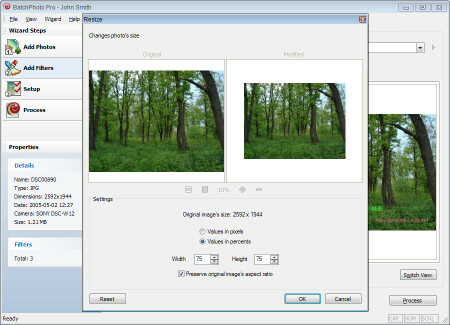 BatchPhoto supports a large number of graphical filters, in total there are 39 different filters plus the rename filter. Annotate - comment, date, watermark text, watermark image. Touch-Up - auto contrast, brightness, contrast, color balance, equalize, hue/saturation corrects, levels, reduce noise, sharpen, unsharpma. Transform - crop, flip, resize, roll, rotate, thumbnail. Effects - blur, border, charcoal, edge, emboss, gaussian blur, black & white, implode, median filter, noise, oil paint, raise, sepia, solarize, shade, spread, swirl, wave. Convert pictures from one image format to another. Apply profiles on multiple pictures with the right mouse click directly from Windows® Explorer. Use projects and profiles to improve your productivity. Take advantage of accurate previews for both the original and the enhanced photos. If you need more information please contact the developers of BatchPhoto (Bits&Coffee), or check out their product website.